With the holiday season fast approaching, retail supply chains must ramp up efforts to ensure they are properly prepared to meet the spike in demand. However, one area that many retailers seem to be facing issues with as of late is their search for temporary workers. Seasonal hiring has always been a go-to solution for retailers to handle the influx of consumer sales hitting their organizations in the months leading up to and immediately following the holidays. However, The Wall Street Journal recently reported that even though many retail companies began recruiting holiday-season workers back in August, there seems to still be some sign of difficulty in getting that extra help they need. 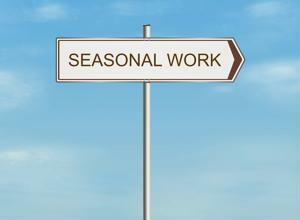 Typically, recruitment for temporary hires usually begins in September. The source explained that over a quarter of the retail employees hired in last year's fourth quarter began working in October. Whereas in the past, the holiday season was considered to begin immediately following Thanksgiving, now consumers are starting their holiday shopping even before Halloween. Some industry giants, including J.C. Penny Co., United Parcel Service Inc. and Macy's Inc. began recruitment and hiring earlier as to get a head start on competitors. This explains why more retailers are starting to recruit seasonal hires earlier in the year than they may have previously. Unfortunately, it seems there is a lack of available workers, indicating a tight labor market. According to The Wall Street Journal, adding to the complexity of this situation is the fact that retail organizations have to compete with warehouse, logistics and distribution companies that are also increasing use of temporary workers during peak months due to e-commerce growth. Employers throughout the retail and supply chain industry are in a predicament. "[They] anticipate stronger consumer demand and expect that it will be harder to find the people they want to hire," Indeed.com Economist Jed Kolko told the source. The Wall Street Journal added that The National Retail Federation estimates somewhere between 640,000 and 690,000 seasonal hires will be added by retailers this year, indicating it will stay steady with 2015, which totaled 675,300 temporary holiday workers. It's no news that the growth of omnichannel purchasing has led to retailers needing to restructure supply chains to better meet the demands of the online shopper. And while this does include hiring more workers to manage the increased store traffic and handle spikes in customer service needs, a lot of these seasonal workers will be needed for the backend operations, such as in warehousing and fulfillment centers. For example, according to The Society of Human Resource Management, Target plans to add 7,500 seasonal workers to its distribution and fulfillment facilities this year - about 1,000 more than it did last year. However, it is not just the retailers that have to deal with the up tick in online spending. The SHRM explained that, over the past few years, transportation and warehousing are the segments that have seen the most growth in seasonal hiring. In November and December last year, employment in these sectors grew by more than 200,000 employees, the source reported.